People tend to pass through Cardwell on their way to somewhere else, but we decided to have a weekend there and walk a few interesting tracks around the area. Seven of us jumped the gun and went up on Friday, planning an extra night of spotlighting led by Daryl and Geoff from the Cassowary Coast and Hinchinbrook branch. We hoped to see a mahogany glider but would have been happy with a possum. 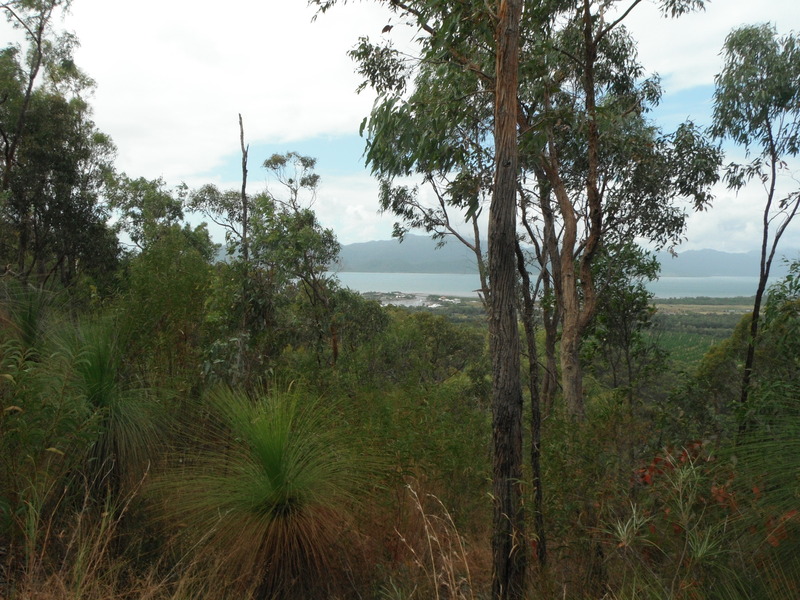 The sky and the forecast were a bit worrying but we set off along a dirt track just to the north of Cardwell. It wasn’t long before light misty rain turned heavier and we decided to turn back and accept Daryl’s and Geoff’s kind offer of hot chocolate and warmth at their home. Next morning was fine and smelling wonderful after the last shower. We were to meet the rest of the group coming from Townsville at midday. It looked for a while as if ‘all day breakfast’ at a local cafe was becoming a fact, as breakfast for some merged into morning tea and early lunch, but we broke away from the table and met up with the rest to check out the Forest Drive in behind Cardwell. The first track off the Drive was up a low hill to three lookouts over the district. 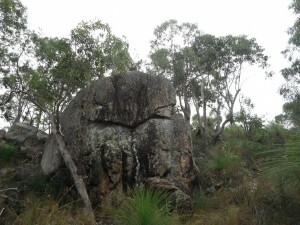 The vegetation was fairly similar to that around the outskirts of Townsville: grasstrees, bloodwoods and eucalypts, several species of Acacia. Plantos were happy to find Acacia calyculata now with pods not white fluffy flowers, having previously found it at the bottom of Bluewater Range. Some grey fantails were zipping around and there was a bar-shouldered dove, but it wasn’t a good time of day for bird sightings.The views showed the extent of pine plantations on the plain and the disruptions to remaining native vegetation by roads, powerlines and residential areas. 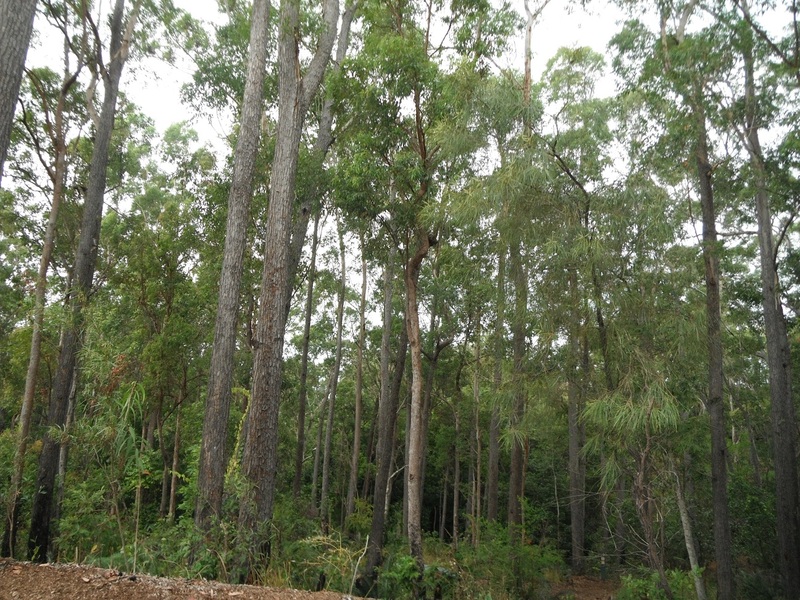 This lack of connectivity affects many species of wildlife but is especially worrying in the case of mahogany gliders most of whose limited habitat had already been destroyed by clearing before it was recognised as a separate species and rediscovered in 1989. 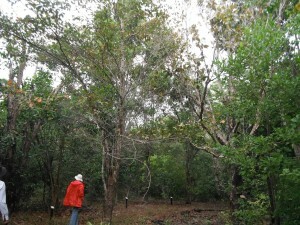 Sue, from the local branch who came with us, showed us a large area of native vegetation planted on a former pine plantation with the consent and cooperation of HQ Plantations after the pines were destroyed in cyclone Yasi. Unfortunately HQP were obliged to replant pines on the rest of their holdings, but this revegetated area is one of a number in the district which will provide food trees for gliders and corridors between isolated habitats. 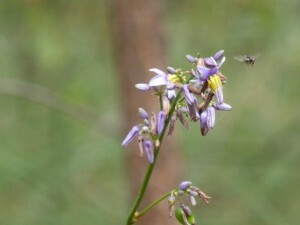 Next it was Attie Creek Falls. From the carpark and picnic area there was an occasionally steep but overall easy path up to them. The trees here were much taller and more impressive than at the previous site. 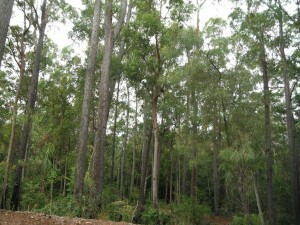 The dominant tree was Gympie messmate Eucalyptus cloeziana. We’d seen smaller specimens on hills around Hencamp Creek last year, but higher rainfall and trees closer together here made them magnificent straight trees. Attie Creek flows down a fairly narrow gully, widening out to occasional pools. The falls were waiting for the next wet season to grow into the name, being just a trickle. We had to miss Dead Horse Creek despite its appealing name, as we needed to get back to town, but did manage a short stop at the Spa Pool to admire its bright blue water. 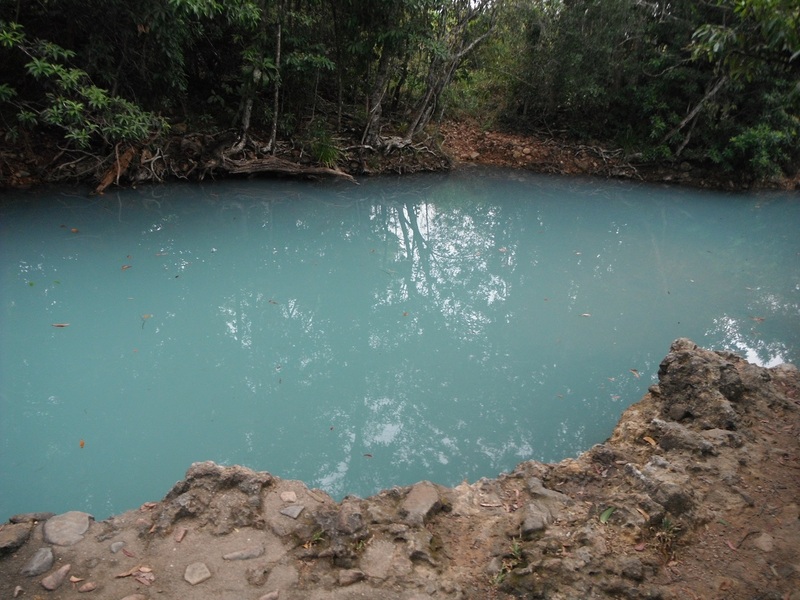 This is caused by minerals in the ground in the catchment area. (Bluewater Creek north of Townsville was once blue too, but decades ago something was done upstream, land clearing and/or allowing cattle access to the creek, which turned the water a dirty brown and it has never recovered.) By chance we’d chosen the same weekend that the local WQ branch along with Terrain NRM, some graziers and the Lions Club were holding a fund-raising event with Cow Poo Lotto to be the main attraction, followed by spotlighting in the surrounding bush. Due to a total lack of cooperation and defecation by the bovine stars, cow poo lotto was a total flop, as no cow flops landed anywhere on the tennis court marked with numbered squares. In an anticlimax the winning number had to be picked out of a bag instead, and one of our group won first prize. After the kids’ spotlighting, where they had to find large cut out animals among the trees, the adults with red cellophane covered torches had a turn looking for live ones, but the only animal seen was a megabat flying over. Next morning was overcast, and after the usual dramas of people having to rush back to motels for forgotten items or into shops, the small convoy headed to the Arthur Thorsborne Arboretum. 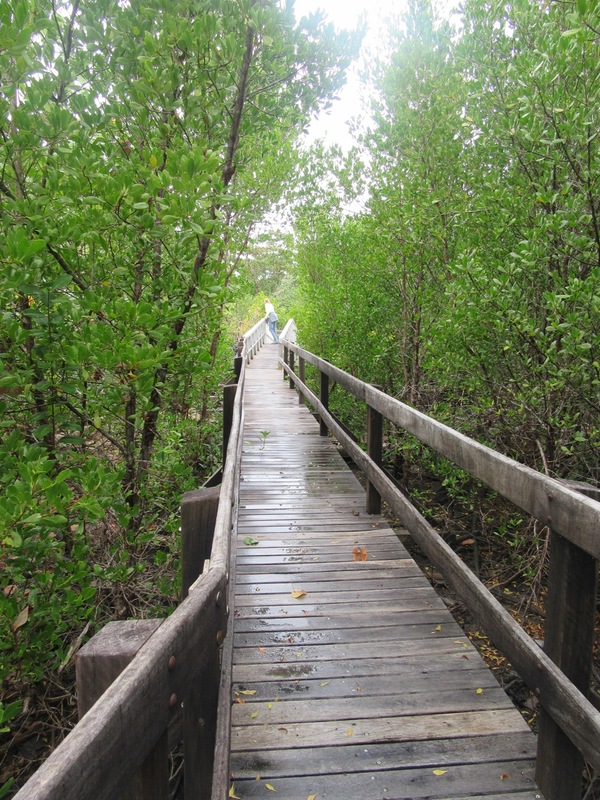 This was started in 1992 by Margaret Thorsborne (assisted by many volunteers) on an area of degraded land at the entrance to the Edmund Kennedy section of the Girramay National Park . The primary aim of the tree plantings was to provide food for cassowaries and pied imperial-pigeons. It was well-established when first damaged by cyclone Larry and recovering well when cyclone Yasi smashed it. More trees have been planted and some damaged trees have regrown. We didn’t spend much time there as the rain started as soon as we arrived and just became heavier, so we continued into the National Park where the rain stopped. From the car park the walking track wound through the dunes and mangroves and came out onto the beach further north. We found some old cassowary scats along the path and lost a few from our group who turned back, but most of the group then walked south along a deserted beach to return to the cars and a quick snack before returning to Cardwell and the all day breakfast. Thank you to Daryl, Geoff and Sue for adding to the enjoyment of the trip and to Margaret and Liz for photos.